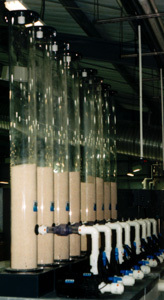 RK2 Systems Fluidized Sand Filters utilize continually moving "porous sand" in a clear acrylic column to provide large de-nitrification capacity in a small footprint. These proven Bio filters have a distinct advantage over other types of Bio filters as 100 % of the media surface area is utilized in the de-nitrification process. They are capable of being placed inline in a low pressure system and maintain a constant flow rate with virtually no maintenance. Specifically engineered Ph compatible medias allow RK2 Systems FSF filters to be used in either Marine or Freshwater applications. Coupled to an Ozone equipped Protein Fractionator, they create a complete Aquatic Life Support System. Innovation and quality are built into every RK2 Aquatic Life Support product. Contact an RK2 Systems professional for specific applications and quotations. STRICT MONITORING AND CONTROL OF OZONE DOSAGE IS NECESSARY TO PREVENT FORMATION OF FREE STABLE OXIDANTS IN SYNTHETIC SEAWATER AND BROMINE COMPOUNDS IN NATURAL SEAWATER. ORP VALUES AT NO TIME SHOULD EXCEED 450 mv. DRY MIX SEA SALTS MUST BE COMPLETELY DISSOLVED BEFORE EXPOSURE TO OZONE. MAINTENANCE DOSES OF .15 MAY BE MAINTAINED, CONCENTRATION SHOULD NOT EXCEED .20.